Electrostatic voltage falls steeply as the distance of separation increases. It would therefore be desirable to shift the overhead alignments as far away as possible. This is not possible in the signalling circuits. They have to be nearer to the track, to cater for making connections to signals, tracks, points, etc. Electrostatic voltage can be eliminated by providing an earthed metallic screen between the catenary and the signal and telecommunication lines. It is impracticable to provide metallic screen around long lengths of overhead lines. If there is no parallel path through the earth, the whole of the traction return current would flow in the rails throughout their length, the screening factor of the rails would have a low value i.e., the rails would provide effective screening. leaves them and flows in the parallel path provided by the earth. In such cases, the screening factor that arises from the traction return current is highest. 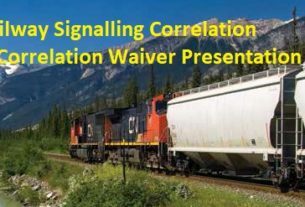 The same screening factor is lower near the vehicle and near the sub‑station than elsewhere because the large portion of the traction return current flows in the rails at these places. The return current through the rails helps in reducing the induced voltage to some extent. 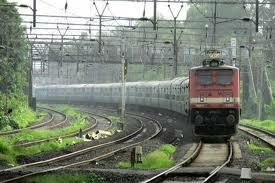 This property of the rail current is defined as RAIL REDUCTION FACTOR. The rail reduction factor improves with the number of tracks and it is therefore possible to get greater reduction of induced E.M.F in the case of double and quadruple tracks than in the case of single track. Rail reduction factor is 0.56 in the case of single track and 0.4 in the case of double track. 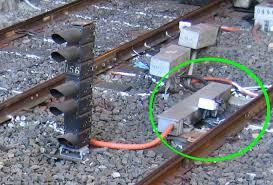 As already stated, any conductor linking with magnetic lines of, force produced by traction currents, will have an induced voltage. The rails, being conductors, also will have voltages ‘induced on account of the magnetic lines of force of the traction currents. The induced current in the rails introduces a further screening factor and one affected in the opposite way by the resistance of the path through the earth. If the contact resistance between rails and ballast and earth resistivity are high, little induced current can flow and there is correspondingly little screening effect from the rails. Presence of a conductor in the magnetic field of the main source, reduces induced voltage. This property has been taken advantage of in the manufacturing of cables. While the cable cores are individually insulated and provided with insulated sheathing to make them compact, one more metallic sheathing is provided over this. The entire cores and metallic sheath are then covered by an insulated overall sheathing. This metallic sheathing can be in the form of an aluminium extruded pipes or strips of Aluminium covering the cores. These type of cables are called screened Cables. To reduce the voltage in the core, the sheath must carry current in opposite direction to catenary current. For this, cable sheath should be part of a return current circuit that is completed through the earth. For effective screening, earthing of cable sheath at frequent intervals is insisted upon. 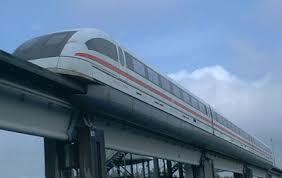 A portion of the traction return current passes through the earth and other metallic objects lying in the earth beside the rails. There may be other cables, water pipes etc., in the path of the traction return current and these also tend to reduce the induced voltage in S&T conductor.